Not every scientist knows exactly what they want to research when they grow up, but AAAS member Dan Blustein is having fun figuring it out. A newly-minted biology Ph.D., Blustein has studied octopi in the Caribbean, built a robotic lobster, written science news articles, and even tried film production in Hollywood. Growing up, Blustein figured he would become some kind of scientist or doctor. He attended Kalamazoo College, where two internships his freshmen year helped clarify the future. "The first was at the Seattle Aquarium, where I worked with octopus and it was amazing," Blustein said. "The second one was shadowing a doctor and it was miserable....medicine was out, and science was in." His senior thesis, a documentary film about how people interact with voids like the Mojave Desert and black holes, inspired Blustein upon graduation to head west—where else do all young aspiring scientists go?—Hollywood. For about two years he worked his way up from intern, to mailman, to production assistant—helping read scripts, fetch sodas for actresses, or buy rights for pictures hanging in the background of a scene. While intrigued by the creativity of filmmaking, Blustein found himself more and more immersed in the business side of the movie industry, where producers had to keep everyone else in line and seemed unhappy doing it. "It was exciting, but it was soul-draining," Blustein said. "So I thought, 'I don't want to work in Hollywood anymore... I'm going to apply to grad school.'" Going back to his first passion, he applied to marine biology programs, in part because it allowed him to delay picking a specialty. Within marine biology, he could study a wide range of topics, from ecology or evolution to genetics or neuroscience. On a visit to Northeastern University in Boston, Mass., his primary interest was their strong microbiology program. But he also met with Joe Ayers who ran an underwater robotics lab. 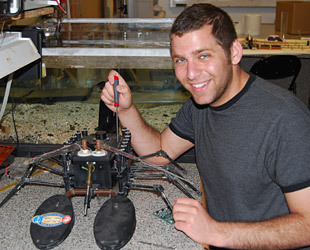 Ayers was looking to update a robotic lobster his lab had prototyped for the U.S. Navy, which was interested in having a relatively cheap, disposable robot to detect underwater mines in nearshore environments. Blustein had no engineering nor programming experience, but was entranced by the intersection of biology and technology. "It seemed like the coolest research I could do," Blustein said, \so I just went with it." He's spent the last six years building a better RoboLobster—a robot with eight legs, each with six wires to contract or extend the robot's leg "muscles," and an acrylic, cylindrical body containing an electronic circuit board, the brains of the operation. "The most challenging part was wanting to do something, but having to learn how to do it first," Blustein said. The process was: "I need to learn this programming language, so I can program this chip, so I can run this experiment." The hard work paid off. Besides potentially helping the Navy, the new and improved robot can now run computational neuroscience models, enabling researchers to test biological theories by programming the robot with certain hypotheses, seeing what happens, and comparing it to real world observations. It also can help shed light on how to prevent other robots from getting lost in the bottom of a deep sea trench or stuck in the dirt on Mars. Animals rarely get lost or stuck, Blustein said. "If we can figure out how the animal adapts to its environment and unexpected circumstances," he said, \"those are lessons we can draw from to develop our robots." While in graduate school, he also continued to help with octopus field experiments in the Caribbean, and in 2013, was an AAAS Mass Media Fellow. Reporting for the Raleigh News & Observer not only helped improve his writing, but interviewing a wide range of researchers broadened his perspective on science. The best part of the experience, he said, was meeting the other fellows. "It's valuable professionally to have these connections with people who are of similar mind," Blustein said. "Some were physicists, some were biologists, but we all had this same passion for science and communication." Since earning his Ph.D. in January, Blustein has been thinking a lot about his future, and where along the scientific spectrum he'd like to land. For now, he's headed to the University of New Brunswick in Canada to research new ways patients control prosthetic limbs. Right now, amputees need to look at their prostheses to move them. Blustein and his colleagues are interested in finding what sensory information about joint movement can augment visual cues. He's eager to apply what he's learned about computational nervous system models in RoboLobster to humans, and hopefully help patients. He's also looking forward to interacting with people on a day-to-day basis, rather than just a solitary robot. Interaction is a key consideration when Blustein ponders his future. "I think I enjoy interacting with people too much to do only lab work," Blustein said, \"but I am interested to see how this new lab work is going to go; is it more dynamic and engaging?" Blustein's varied interests and adaptability will surely serve him well,wherever he ends up. But if he ever gets stuck, maybe RoboLobster can help him out.